When it comes to jackets, there is more to consider than what meets the eye. The lining is a relatively unseen element among the options that go into making a jacket, but its contribution to the overall look and feel of the garment should by no means be underestimated. Jacket linings serve several purposes. As a thin layer of cloth that separates the jacket from the wearer, the lining both protects the cloth that goes over it and reduces friction as the jacket is put on and taken off. What’s more, the lining gives extra weight to the garment – whether it be a jacket or coat – thereby contributing to its shape and the way it falls on the body. How much weight depends on how much lining you choose to add to the garment. For instance, a full lining covers the entire inside body of the jacket, while a half lining covers only the upper half of the inner back and sides. A quarter, or “butterfly” lining covers only the upper back and sleeves. This last option is appropriate for tough, heavy fabrics such as tweeds, since you don’t want to add too much extra weight, or for a jacket intended to be worn in warmer weather. 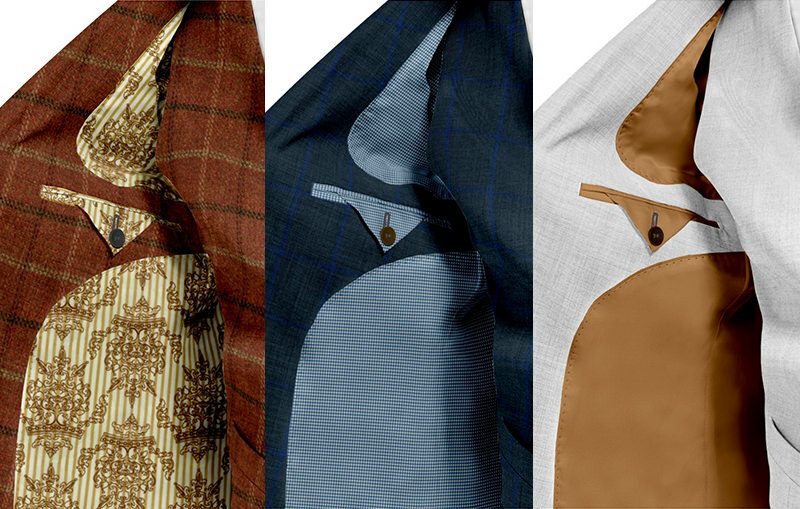 Vests and waistcoats are also lined, on the inside chest and on the back. Whatever the garment, linings offer a sometimes overlooked opportunity for self-expression. If we agree that blue/grey/brown are the timeless suit colors, then where but in the obvious shirt/tie/pocket square/boutonniere options can a man show a little style? In the lining! Though sleeve linings are traditionally striped, you’re by no means restricted by tradition, and you can certainly choose from a variety of fabric colors and patterns to add a bit of personality to any lined garment. The sleeve lining is traditionally striped, but many other options are available. If you’d like, you can add piping, which is a narrow braid of cloth sewn along the edges of the inner lining as a finishing touch. It can be the same color as the lining itself, or a contrasting color. All that being said, a few general rules do exist. A pale-colored jacket should only be lined with a pale-colored fabric due to the “see-through” factor, even in the sleeves. Also, when making a three-piece suit, the back lining of the vest should be the same as the jacket or sleeve lining for continuity. When it comes to linings, feel free to break the rules. Unless you decide otherwise, no one will be the wiser.